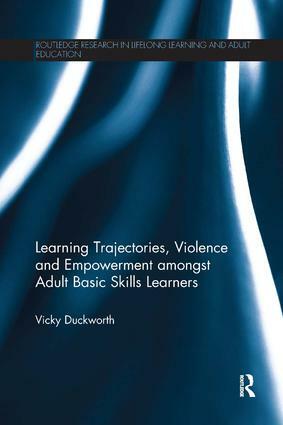 Learning Trajectories, Violence and Empowerment amongst Adult Basic Skills Learners offers deep insights into the lives of marginalised communities and the link between learning, literacy and violence, not previously carried out in-depth in a small scale study. It breaks the negative stereo-types of adults who struggle to read and write, who are often labelled and stigmatised by dominant discourses, and in doing so exposes why and how Basic Skills Learners often find themselves in marginal positions. The structural inequalities many face from childhood to adulthood across the private and public domains of their lives are revealed and probed, thus challenging neo-liberalism claims of an apparently egalitarian social field. The learners’ narratives expose the contradiction, complexities and ambivalences they experience in their daily lives, and how they try to make sense of them from their structural positioning as basic skills learners in a society based on inequality of opportunity and choice. Applying a feminist, qualitative, longitudinal, ethnographic and participatory approach, the book offers a critical perspective, drawing on Bourdieu’s work as the theoretical framework, as well as using a range of feminist, sociologists of education, literature on the ethics of care and critical literacy pedagogy, including the New Literacy Studies. The author’s personal position as an ’insider’ with ‘insider knowledge’ of marginalised communities is also woven throughout the chapters and offers insights into the struggles, conformity and resistance faced by the participants in the study. The book contributes to the debate on the impact of violence on learning and its link to class, gender and basic skills as well opening up a discussion on the power of a critical curriculum to empower people across the domains of their lives. It will be valuable reading for trainee teachers, teachers, education and sociology students, postgraduate students, as well as literacy specialists, researchers, academics, policy makers and managers of public services.